Admission by donation at the door (suggested $10). 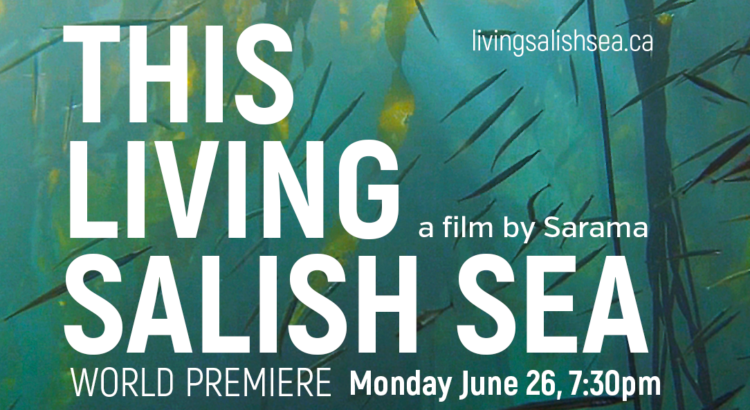 I would like to invite you to the premiere screening of my documentary, This Living Salish Sea. In the summer of 2012, I was working on a short film, This Living Earth at Gospel Rock. As I spent time in the forest and under the sea filming, I contemplated the wider threats to the Salish Sea, because, looming on the horizon, was the proposal from Kinder Morgan to build a new TransMountain pipeline to increase shipments of Tar Sands diluted bitumen, meaning an enormous increased risk to the ecology from tanker traffic through the Salish Sea. I was aghast at the seeming lack of concern and awareness amongst the general public about the issues. Having had long experience of how rich the life was in this sea, I could only imagine that people must lack this knowledge and intimacy with the living treasure that lies at our very doorstep. No other explanation came to mind to account for the apparent willingness to accept such certain terrible risks, with so little benefit to the public. I thought about making a film about this, to help the public become aware of both the issues, and the incredible richness of this sea, which is one of the most bio-diverse and productive on the entire planet. But this was a very intimidating thought. Who did I think I was, to think of taking on such an enormous and challenging subject? I was an artist, a diver, a “no-budget” film maker. I had woefully inadequate production resources, no budget, no training in science, etc, etc. In short, the list of why I should not do this film was very long. But, the more I thought about this film “that I did not want to make”, the more I realized this was the one film I had no other choice but to make. The consequences of doing nothing, while being fully aware of the stakes, were simply unacceptable. So, in early 2013, I bought some gear to take on the task, and without any budget, I started filming. It has been a long journey, in time, in space, and in learning. The making of this film has changed me. As an artist, I understand that this is the way it should be. After about a year, when I started to show some of the results of my work, people came forward to help. They contributed money for production costs, they shared their music, they shared their photos and film footage that I needed for the project, they set up a website, they helped with fundraising, some businesses helped with reduced equipment costs, or free dive air, other people helped with production assistance, others offered the use of their boats, several people offered good counsel, some opened their homes to allow me to film on location, others accepted requests for interviews, and many, many people allowed themselves to be filmed in what sometimes were traumatic and stressful circumstances. In other words, the film became the product of a people and of generosity of a broader community. Together, we have all made this happen. What is shown on the screen reflects powerfully the input, the giving and the caring of the community. The film is done; now it will embark on its own journey, to be part of the wider dialogue of what we value in society, and how we will continue this journey of evolution as the human species. I hope you will be able to have the opportunity to watch the film, and that it may help in some way to make our local environment and the planet, a healthier place. A very special thanks to Billie Carroll and the Green Film Series board volunteers for generously hosting this event! With warm regards and gratitude.